For Gil and Kelly Bates and their kids, Valentine's Day (aka I Love You Day) is a family affair. The entire family dressed in their fanciest clothes and gathered to exchange gifts. All the married couples were present (Zach and Whitney and Bradley, Erin and Chad, and Alyssa and John), as well as Michaella and her boyfriend, Brandon. I love their tradition. I think it is so sweet! How sweet! I love that they make it into a special occasion. Love the family photo. I LOVE Whitney's hair!!! But out of curiosity I was wondering why it was blonde for her wedding, and then on the video clips you see it brown, and now its blonde again? Unless of course I'm looking on the wrong side.?!?! Anyway, Thanks so much Lilly and Elllie for this blog. I don't have TV, so this is how I keep up with the Duggars and Bates! =D Thanks SO much! Sweet picture, sweet family. Just curious, where's Callie in the picture? I can't seem to find her! 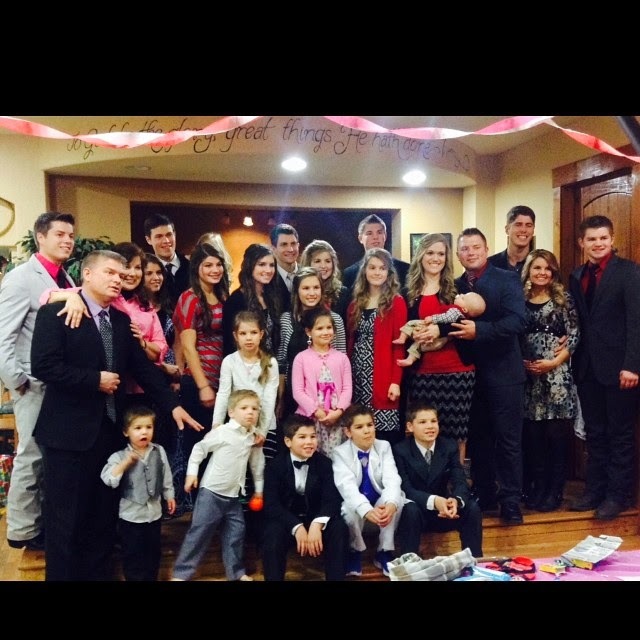 I belive that Brandon is holding Callie top left corner there is a little blonde head sticking out. Lily, Ellie can you reveal if Michaelle was engaged yet? I was just wondering what perfume Tori got as a gift, that she said was her favorite, on the "I Love You Day" episode.